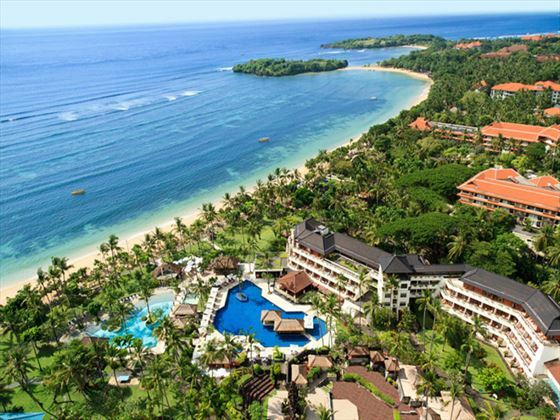 Nestled within nine hectares of lush tropical gardens, Nusa Dua Beach Hotel features all the elegance of a Balinese palace, exposing the rich Balinese traditions and culture, yet offering every modern amenity and convenience for a luxurious getaway. 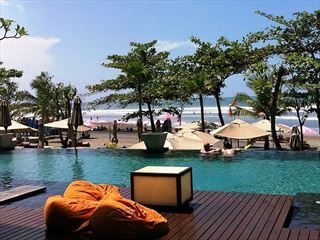 Located on the beautiful silky sands of Nusa Dua, Nusa Dua Beach Hotel & Spa provides an oasis of space and tranquility in the heart of exotic Bali. The 381 rooms and suites resort invites you to immerse yourself in the pageantry of one of the world’s most vibrant cultures, with stunning lagoon or garden views and a collection of wonderful, traditional artifacts and decor. 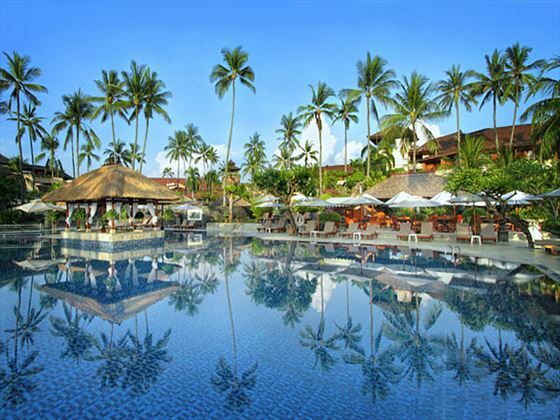 With four swimming pools, you won't be short of gorgeous spots to soak up the sun or take a leisurely dip, whilst Balinese dance classes and coconut leaf weaving classes will give you a taste of authentic Balinese living. We love the Garden Tour that takes place every Thursday, giving you the chance to learn all about the exotic flora that surrounds you as you relax and unwind. No matter how much or how little you do in the day, we're certain you'll work up an appetite. 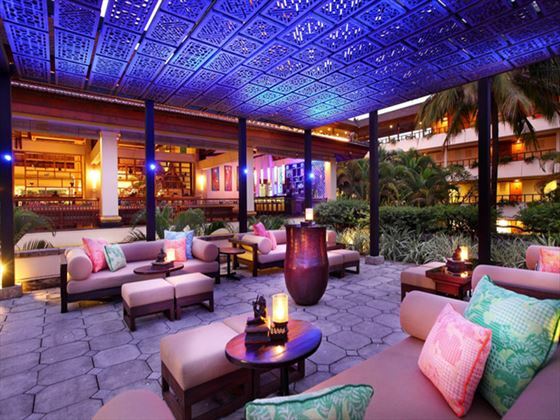 Nusa Dua Beach Hotel has a plethora of innovative restaurants to sneak a taste of, including local Asian delacacies at Tamarind Kitchen and Bar, or sensational Japanese yakatori at Maguro’s Asian Bistro. A palace of refined luxury and privileged hospitality, this 5-star diamond property is perfect for an unforgettable holiday experience. NB: This hotel has recently made the decision to go Halal-only. 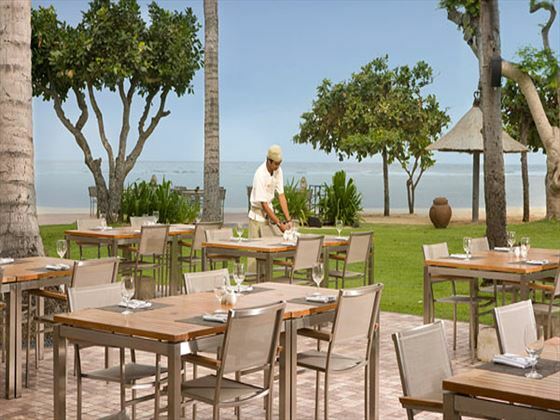 Located on the southern peninsula, just minutes away from the International Airport on the sun-drenched shores of beautiful Nusa Dua, the hotel boasts a wonderfully tranquil ambience, with a backdrop that will make your jaw drop. Appointed with elegant Balinese touches throughout, these spacious and comfortable 34sqm rooms overlook stunning views of the lush, tropical gardens from a private balcony. Airy and sophisticated, these 40sqm rooms feature a heightened level of private living space and pampering facilities, as well as beautiful garden views from a private, furnished balcony or terrace. Decorated with bright, serene Balinese details, these 45sqm rooms are equipped with a king-size bed and an additional single bed. A spacious bathroom and additional storage space make this room a great choice for small families. This expansive 70sqm room is made up of two adjoining Deluxe Rooms, connected through sliding doors. One room features a king-size bed whilst the other is appointed with twin beds, and both rooms offer a luxury en-suite bathroom and storage facilities. Accommodates up to four adults, with an extra bed available for a child. These exclusive club-level rooms showcase spectacular garden views and beautiful, ornate décor. Decorated with hand-loomed Balinese fabrics and ornate polished wood, the rooms are filled with natural light by day, and bathed in a warm glow at night after turndown. Guests will also enjoy a wonderful selection of exclusive Club Privileges and access to the Palace Club Lounge. Delight in waking up to stunning vistas across the shimmering lagoon, which you can access directly through full-length glass sliding doors from these ground-floor rooms. 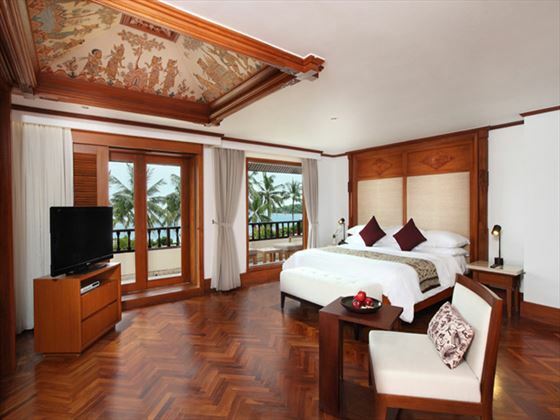 Appointed with polished parquet flooring, stunning, ornate bedheads and delicate Balinese fabrics, these rooms create an indulgent sense of luxury combined with exclusive Palace Club access and privileges. Combining state-of-the-art facilities with a heightened level of private, serene living space and traditional Balinese décor, these club-level suites offer a full list of indulgent club privileges to complete your stay. You will discover a sanctuary of total rejuvenation and serenity in these suites, appointed with a plush bedroom, spacious separate living room and an alluring en-suite bathroom. 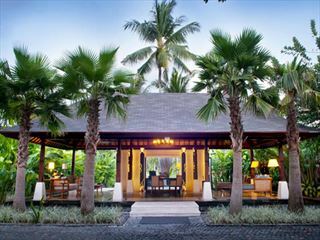 Every suite is also graced by a beautiful veranda that leads through the lush tropical gardens to the lagoon pools. Savour a classic, romantic design while being spoiled by the exclusive Palace Club comforts. 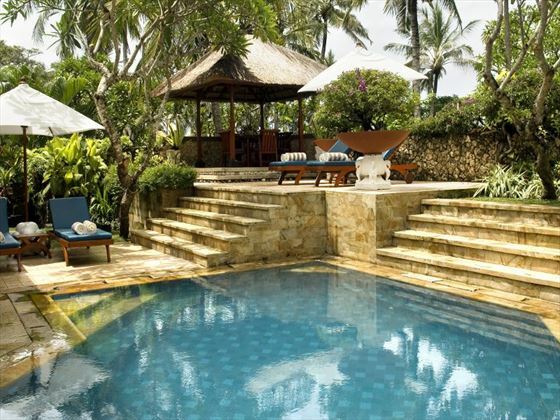 These gorgeous, oversized suites feature direct access to the lagoon pool from a private ground-floor terrace, whilst a luxurious concealed garden has a private plunge pool and outdoor Balinese gazebo for the ultimate in serenity. Enjoy a full list of exclusive club privileges, in addition to two spacious bedrooms, and a sumptuous living and dining area. Spread over 166sqm of luxurious living space, these magnificent suites are named after the majestic views over Mt Agung, which can be admired from an expansive private balcony. 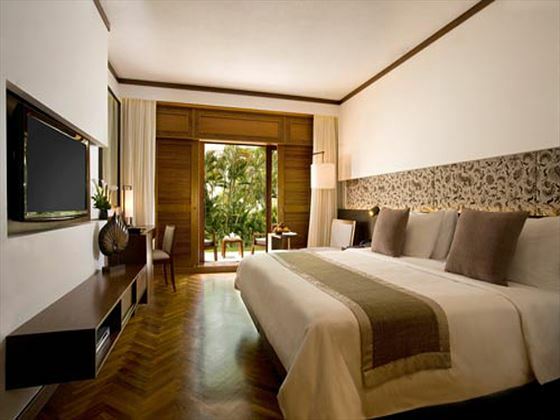 The Agung Suite features one king-size bedroom, and an adjoining bedroom with twin beds. Delight in an exclusive selection of Palace Club Privileges, and spectacular ocean, pool and garden vistas from a fourth-floor location. 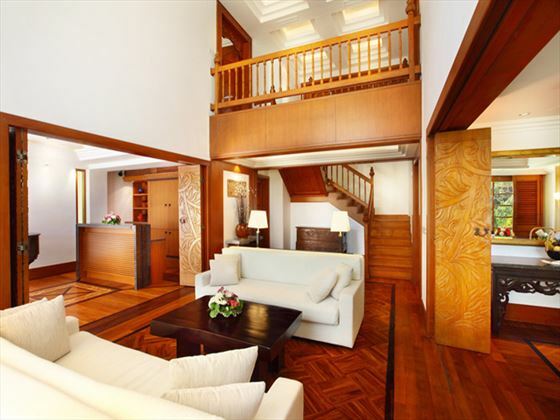 Featuring a private driveway leading to an exclusive reception area, the spectacular two-story Nusa Dua Suite is the resort’s signature accommodation. On the first floor, you’ll find a gracious living area overlooking a luscious, private Balinese garden and mosaic-tiled swimming pool. On the upper level, there are two spacious king-size bedrooms, each leading out to wide verandas with panoramic views across the resort gardens and palm-fringed beach. Extravagant and completely opulent, the Royal Residence was originally built as a private residence, which has since been opened to guests looking for an utterly luxurious and secluded stay. Built over two expansive floors, the residence is complete with magnificent entertaining areas, a catering kitchen, and a full-size pool area adorned by carved Balinese stone reliefs and royal fittings. The property is situated just steps from the sublime beachfront, whilst guests will also benefit from a complete list of exclusive club privileges and a private entrance. 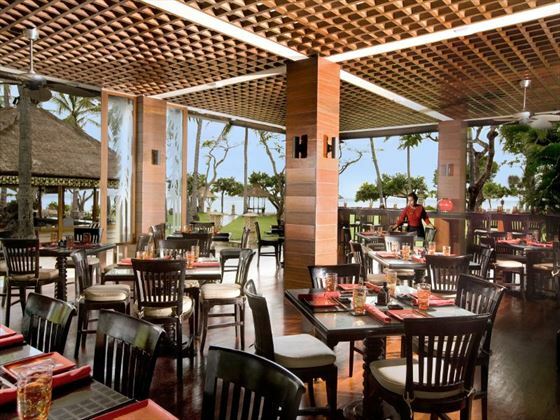 Showcasing magnificent Indian Ocean vistas from a sublime beachfront setting, this wonderful bamboo-thatched restaurant serves a delectable selection of contemporary Asian cuisine and Western favourites, all created using fresh and flavourful locally-sourced ingredients. This is also a lovely spot to relax with a cocktail, wine, beer or fresh juice while admiring spectacular sunsets over the ocean. 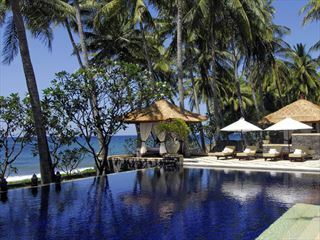 The resort’s signature, award-winning restaurant, Raja’s showcases the finest Balinese cuisine, served amongst an elegant fine-dining setting appointed with a blend of deep woods, ornate Balinese carvings and beautiful fabrics. Serving a wonderful combination of traditional favourites from all across the Asian continent, Maguro is a popular dining venue located just steps from the beachfront and shimmering lagoon pool. From the streets of Hong Kong to Japan’s sushi houses and Korea’s succulent barbeque grills, delight in a sensational plethora of fresh, vibrant cuisine complemented by an international wine list and indulgent desserts. Adorned by a beautiful tropical lotus pond and peaceful gardens, this casual open-air venue offers an idyllic setting to enjoy breakfast, with an endless selection of international favourites and authentic local dishes. This cosy, vibrant lounge and terrace overlooks stunning vistas of the resorts manicured gardens and glistening Indian Ocean. Offering an ambient, laid-back spot to sip on innovative signature cocktails, beers and wines, with private seating and an occasional jazz pianist. Located just steps from the beachfront beside the picturesque pool, Chess Bar is the perfect place to enjoy light snacks and cocktails whilst soaking up the striking surrounding scenery. Located in the midst of the beautiful lagoon swimming pool, this swim-up bar serves delicious cocktails and thirst-quenching drinks all throughout the day. Guests can learn the secret to Balinese traditional cooking, introducing local herbs, spices and cooking techniques to create a feast for all - the class includes hands on cooking, a recipe book and a delicious lunch. On Mondays, you can join the live entertainment Kecak Dinner, featuring Balinese dancing with an Indonesian buffet, on Wednesday's you’ll enjoy the Legong Dinner and Friday's are the beach BBQ and fire dance dinner, located at the beach garden. The Gecko Kid’s Club is available for children from 3 to 12 years old (children under 3 years old should be accompanied by an adult). 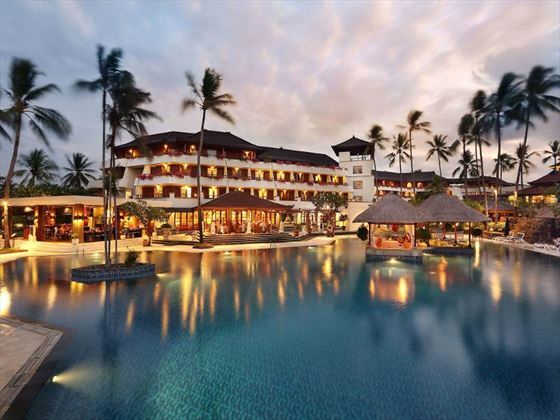 Supervised games and other fun-filled activities are provided, from cultural activities such as Balinese dance, Temple visit and Balinese dress to other activities including sand castle building, face painting, weaving and feeding fish. Full day programmes run from 8 a.m. to 5.30 p.m. and you can choose morning or afternoon for half-day programmes. Children’s playground and pool also available. Please also note that this hotel is a halal-only resort, therefore, pork, ham and bacon will not be available at the restaurants. Pork is easily available in Bali, however, the hotel has made the conscious decision not to serve it.